Posted on August 28, 2016 by Lea S.
I am pleased to present this (relatively brief!) look at the life and career of the underappreciated Louise Fazenda, one of our earliest and most popular female clowns. I am currently researching Louise in as much depth as I can for a possible book project, so if you or anyone you know has any info on her life and career, don’t hesitate to contact me! Custard pies, a chase, a fall, mud, a fire hose, soup, a leak in the plumbing, innumerable lost garments, broken dishes, a slide on a cake of soap, mud in the hair, pie in the eyes, soup down the back, a fall into a lake, policemen, a cleaning up, a bucket of suds and a mop, a slavey with a round-eyed, utterly blank expression, a Mack Sennett comedy–Louise Fazenda. Long before Lucille Ball and Carol Burnett would earn their places in pop culture history, there were a number of comediennes who paved the way for them. The most famous of these was Mabel Normand, the irrepressible, winsome Keystone star. But not too far behind her was another irrepressible performer: Louise Fazenda. Many people today are at least familiar with the name of Mabel Normand, but how many are aware of Louise Fazenda? She was one of the most popular comediennes of the silent screen and one of the most familiar character actresses of the early talkie era, but she often gets no more than a passing mention even in film histories. And yet, she was one of the most well-known female clowns, and–as a bonus–was one of Hollywoodland’s most beloved and charitable individuals. Louise Marie Fazenda was born in Lafayette, Indiana on June 17, 1895–according to numerous fan magazines and newspapers. However, according to her birth certificate the actual year was 1896–perhaps the only time in history when a year was constantly added to an actress’s age. Her parents were Joseph Fazenda, who was born in Mexico but seems to have been of Portuguese, French, and Italian descent, and F. Nelda Schilling, who was Dutch. Nelda (who must not have cared for her first name) was nearly 40 at the time of her birth. Since Louise was an only child, we can probably assume that she was a surprise. They were a religious family, having a particularly strong belief in the importance of charity work. The Fazendas would soon move to Los Angeles–which would turn out to be a fortunate move indeed. Joseph opened a grocery store called Power House Grocery, and Louise, a hard worker by nature, began helping out with the family finances at a young age. She ran errands, babysat, and delivered groceries via a horse-drawn wagon. As she later recalled, for a time she was a “newsie,” too. As a teen she tried out several jobs while attending Los Angeles High School (where she had her first taste of acting in school plays): assisting a doctor, a tax collector, a dentist, and working in a soda fountain. She graduated in 1912 and planned on going to college, but when her father’s business suddenly folded that was no longer possible. Louise would continue to help support her small family, partly through thespian means. When she was a star she would sometimes refer to her time “on the stage,” although it’s hard to discover exactly what meant. She seems to have been in dramatic stock companies, supporting leading women Virginia Brissac and the popular Los Angeles native Miss Lucretia Del Valle. At any rate, on the advice of a neighbor Louise decided to look for work in a young industry that was practically on her doorstep–the “picture business.” “Acting was the only thing I wanted to do, so I applied at Universal–and got it,” she later recalled. Louise during her Universal days. Appearing in Mike and Jake at the Beach (1913), Universal Weekly. Joker comedies were as lively and silly as any Keystone product, full of broad humor, thick makeup, and loads of knockabout. The eclectic variety of settings and situations meant that Louise had to constantly change her appearance and acting style to fit whatever whim the director had that day–a perfect comedy training ground. Joker titles included Mike and Jake Live Close to Nature, A Freak Temperance Wave, The Sharps Want a Flat, and, most intriguingly, In the Year 2014. In 1914 the versatile comedienne was wiled away from Universal to the mighty Keystone Film Company–the most popular comedy studio in the nation. It’s possible that with Mabel Normand being busy with the “Fatty and Mabel” series Sennett wanted more leading ladies. Her first big role was as Mack Swain’s battleaxe wife in Willful Ambrose, released March 1, 1915. Her performance was broad and fearless, as was her makeup–featuring bushy eyebrows and hair scraped up in a bun on the crown of her head. However, her real first appearance on Keystone celluloid took place in Ambrose’s Sour Grapes (1915), which was filmed first and released around the same time. She had the lofty role of “Girl in Park Who is Shot in Rear”–a very Keystone-esque initiation. The studio soon noticed that the comedies Louise was in were always good box office, so she was soon given her own series as a character called “Maggie.” While she was an attractive gal, she was most at home in roles where she portrayed a gawky country girl in unfashionable dresses and moth-eaten hats. She soon developed a distinct costume of a plaid or calico dress, old high-top shoes, and–most important of all–two tight pigtails wound into knots high on her head and a forehead spit curl. She said the memorable hairstyle was based on one she had as a girl, when her mother well-meaningly did up her hair so tightly that she went around with a “moon-faced” expression. 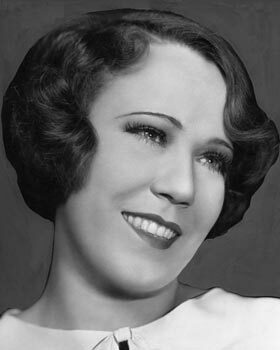 Often paired with vaudeville veteran Charlie Murray, Louise frequently played an assortment of “slaveys” who bungled their way through various chores or jobs, or a country rube falling heir to a fortune that Rascally Villains schemed to take away from her. One of the Maggie comedies, 1917. Like many of the great comedians, such as Roscoe Arbuckle or especially Buster Keaton, she had a clean, precise way of performing gags, sometimes accompanied by a straight face that emphasized her well-meaning if oblivious absorption in a task. In Her Fame and Shame (1917), she’s a kitchen slavey in an unkempt restaurant. When a customer orders eggs, she finds a plate of “eggs with a past” on a shelf, casually blows off a copious amount of dust, and fastidiously wipes them with her apron before reheating them in a pan. Lobby card for Back to the Kitchen (1919). Lobby Card for Treating ‘Em Rough (1919). We might see her today as a bridge between the light comediennes such as Constance Talmadge and the likes of roughhousing, tomboyish Polly Moran–a good-looking young woman who could still pull off a wacky costume and do rough slapstick without a trace of self-consciousness. 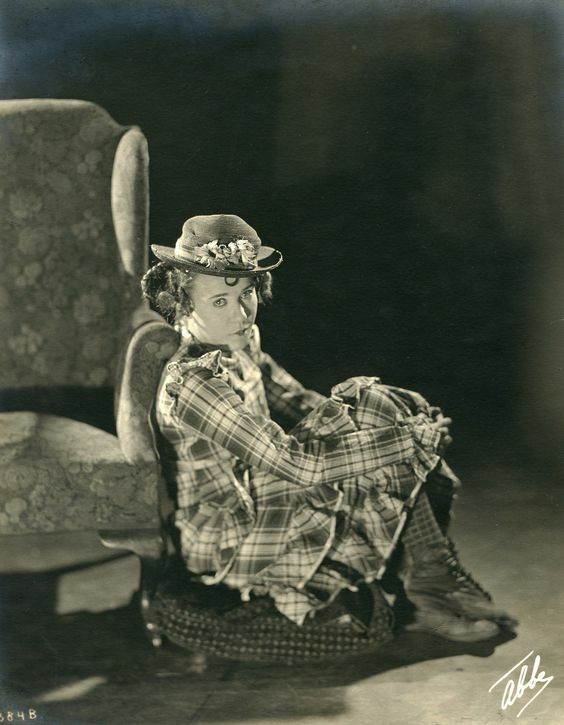 While Mabel Normand was arguably the most important pioneering comedienne, Louise was perhaps more of a true “clown” than Mabel, having a distinctive costume of clothing and hairstyle in the same vein as Gale Henry, Alice Howell and Fay Tincher. Clowning with a goat in Motion Picture News, 1918. In 1920 Louise’s Sennett contract expired. She made some comedies for Special Pictures Corp. and Punch Comedies, and after a brief return to Sennett she worked in Mermaid comedies as well. She proved herself to be a valuable character actress in a number of features throughout the 1920s and 1930s, including Main Street (1923) and The Bat (1926) and Alice in Wonderland (1933). She generally specialized in daffy maids and eccentric aunts, although she could easily dress up to play more glamorous figures as well. One of her character roles. In 1926 she married Hal B. Wallis, a publicist who had yet to “make it big.” The event caused some surprise among fans when it was revealed to be her second marriage, her first being to Noel Mason Smith (a prolific comedy director) from 1919 until their divorce in 1926. Whether because of her career, some unhappiness in the marriage, or some other unknown reason, Louise had kept that part of her life a secret and was not living with Smith when she first became acquainted with Wallis. Her parents and friends weren’t wild about her second marriage at first, feeling that she was too famous and well-off to settle for someone of Wallis’s lowly status. However, they would remain married until her death and Hal B. Wallis would become one of the most powerful producers in Hollywood, responsible for such middling pictures as Casablanca and The Maltese Falcon. Louise and Hal had hoped to have children, but after years of trying it seemed unlikely. In the early ’30s Louise decided to make a pilgrimage to Lourdes, France, and then the Basilica of Sainte-Anne-de-Beaupré in Quebec, both being places credited with granting miracles to the sick and disabled. Amazingly, she would have her first and only child, Hal Brent Wallis Jr, not long after. Photoplay dramatically covered the story under the title “The Miracle of Louise Fazenda’s Baby” in 1933. In 1962, after a full and busy life, Louise passed away at home from a brain hemorrhage caused by arteriosclerosis. The little church that hosted her funeral was jammed with family, friends, and former coworkers from all over Hollywood. Louise was interred in the Inglewood Cemetery in Los Angeles, alongside her parents. The UCLA Medical Auxiliary established a memorial fund in her honor, in memory of her impressive volunteer work. In an era when so many temperamental stars are being remembered with great detail in countless books and articles, let us hope that this warm-hearted woman who gave so much of herself to so many will get some recognition. Among the pool of actresses said to be role models, she is one of a precious few who seems to have truly made herself worthy of such a title. If ever a name deserves to be remembered, it’s the name of Louise Fazenda–one of our earliest female clowns and one of Hollywood’s great humanitarians. I’d like to offer a warm thank you to the staff of the Margaret Herrick library at the Academy for Motion Picture Arts and Sciences! Massa, Steve. 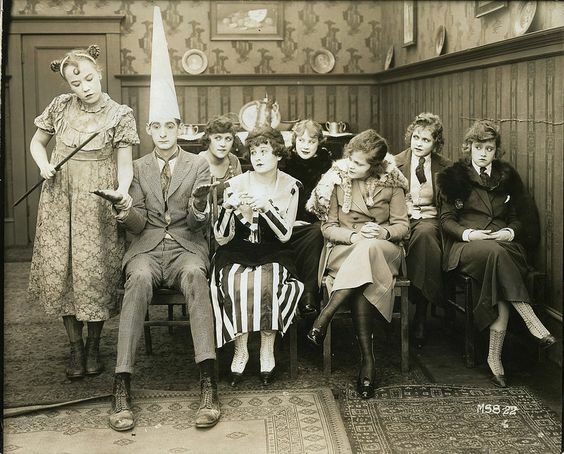 Lame Brains & Lunatics: The Good, the Bad, and the Forgotten of Silent Comedy. Albany, Georgia: BearManor Media, 2013. Lahue, Kalton C. and Gill, Sam. Clown Princes and Court Jesters. South Brunswick: A.S. Barnes and Co., Inc., 1970. Fowler, Gene. Father Goose: The Story of Mack Sennett. New York: Covici, Friede, 1934. Higham, Charles and Wallis, Hal. Starmaker: The Autobiography of Hal Wallis. New York: Macmillan Publishing Co., Inc., 1980. King, Rob. The Fun Factory: The Keystone Film Company and the Emergence of Mass Culture. Berkeley and Los Angeles: University of California Press, 2009. Louvish, Simon. Keystone: The Life and Clowns of Mack Sennett. New York: Faber and Faber, Inc., 2003. Meredith, Edith. “The Miracle of Louise Fazenda’s Baby.” Photoplay, August 1933. Carr, Harry. “Putting the Fizz in Fazenda.” Motion Picture Magazine, January 1919. St. Johns, Adela Roger. “The Most Versatile Girl in Hollywood.” Photoplay, June 1925. Squier, Emma Lindsay. “And They Said She Couldn’t Cook.” Photoplay, November 1919. This entry was posted in Personalities and tagged comediennes, Forgotten Comedians Month, Hal B. Wallis, Keystone Film Company, Louise Fazenda, Mack Sennett, silent comedy, Universal by Lea S.. Bookmark the permalink. Beautiful mini – biography! I had never heard of Louise Fazenda before I started to read your blog. You’re definitely creating awareness, that’s for sure! It seems like she was not only a fine comedic actress, but a worthwhile, good person on top of it. She SHOULD be known, especially for the example she has set. Is that the same Motion Picture magazine you mentioned the magazine that came from Motion Picture Story? If so, I am pleased to see that the magazine’s interview articles turned into more ‘in depth’ material, rather than the fluffy kind they often were before. (My blogs are about those interviews in Motion Picture Story). I’m looking forward to more articles about Louise in the future, and definitely would buy your book if you decided to publish it. Finding out that Louise was a friendly, generous soul in real life was kind of a relief–that’s not always the case! Also, you’d think that being married to one of the most influential producers in Hollywood history would maaaaybe earn you a little more than a teensy mention now and then…! I’m not sure if Motion Picture Story morphed into Motion Picture Magazine–it’s possible, at different times there was Motion Picture Classic, Motion Picture Herald, and Motion Picture News. I love finding out about all these sadly forgotten people! Great bio, Lea! Have you had a chance to look at “The Keystone Kid: Tales of Early Hollywood?” Coy Watson Jr. had nothing but good things to say about Miss Fazenda. There’s a very cute story about her slapstick birthday cake on pages 115-117. I have! That’s a lovely book, Watson really captures the laid-back fun of early Hollywood. And you learn these fun details that are hard to find anywhere else–like the local kids playing on the Cyclorama, for instance. Excellent overview! Definitely someone who does not deserve to be forgotten. Coincidentally, I just finished coloring a photo of Louise earlier today, which turned out quite nice. Might have to do some more of her. You should! 😉 There’s lots of info I could’ve included that had to be left out, and hopefully there’s much more out there to discover, too. BTW, I recognized a few of the photos in your post. :). The Witzel photo (which I assume is from early in her career) is interesting because she is crying. Never saw a portrait like that before. Good golly, you’re right!! Maybe it’s because the online photo is small, but I didn’t notice that! Gotta wonder what the story is behind that, very unusual. An attempt to be a tragedienne? This is wonderful work, Lea! I love that you are giving the spotlight to an underappreciated comedienne. (Much as I enjoyed The Silent Clowns, it has a lot to answer for …) Very cool research, this was a pleasure to read. Thank you so much!! (I thought I replied to you before but it seems to have disappeared into the void, so me being me, I must write again.) It’s been exciting finding out more about her, I’ve been doing as much digging as I can! Excellent tribute to Louise, a funny woman for whom my appreciation grows and grows with each viewing of her comedies. I have to confess, though: the thing that really made me laugh was the nickname they came up with for Louise’s hubby Hal B. Wallis (“The Prisoner of Fazenda”). 😀 I get a kick out of that too! Glad you stopped by, Ivan. This article made my day. Thank you. You are most welcome, Barry! It was exciting to write a proper tribute to her at last. Thank you for the compelling story of Louise Fazenda. I love the expression “irrepressible”, but often it seems misapplied. Certainly not the case of Louise. Beautifully researched and written essay, Lea. It’s heartwarming to know that there were some wonderful people in Old Hollywood. Alas, these are not the ones that get books written about them. Another example is George Arliss who, by all accounts, was truly a fine person. In Mr. A’s case, I gave up on anyone writing about him so i did it myself – five books now and counting! So I encourage you to put Louise’s life and career between book covers. BTW, I have a copy of THE LIGHTHOUSE BY THE SEA (1924) where she stars with Rin Tin Tin. I heard that she got the leading lady role because other actresses were afraid of Rinty. Apparently, he was known to bite. That wouldn’t stop Louise! 😉 She was quite the daredevil at times, her son once said that she had a “child-like love of excitement.” Oh yes, for every twenty or so spoiled, demanding stars there was someone who didn’t let fame go to their heads. It’s important to give them some of the spotlight, since many people only think of Hollywood as a film noir-ish, scandal-ridden den of perpetual depravity and shattered dreams, where no one with an ounce of normalcy ever trod. Thanks a lot, Kenneth Anger. Fantastic, oh I love her! lol. It all clicked why you have taken to this woman so. Really looking forward to seeing more, and learning more. I love that she married Hal Wallis! That’s amazing!! So she didn’t end up like Mabel or Florence Lawrence or someone like that! Her baby picture is so adorable, and the picture of her with HER baby is beautiful. Very inspiring, and what a service you have done to this great artist!!!! Lea does it AGAIN!!!! There’s a lot more that could’ve been added, but something has to be saved for future projects! 😉 (I’m plugging away on it, believe me!) It was actually really exciting to find out that for once a star you really like was a genuinely kind soul in real life, if you know what I mean, lol. I read this bio today—Christmas Day—what an appropriate treat! Your excellent writing style is the “frosting on the cake” of a beautiful life story. I loved this essay and I very much look forward to your book. Her filmography is impressive. If you can, view CROSSED LOVE AND SWORDS (1915) which shows Louise in an early non-slavey role. I have read quotes over the years where Louise Fazenda and Alice Howell bemoaned adverse reactions by audiences to playing middle class women and both comedians said their producers would send the back to the mop-bucket. IIRC former co-workers Louise and Raymond Griffith opened some grocery stores in LA in the early 1930’s. I have seen a picture of them publicizing the markets. SEXIST ALERT: Louise was gorgeous. Thanks Tommie, I’m thrilled you enjoyed it! Yes, Louise’s early interviews seemed to emphasize her quirkiness and longing to be a “pretty actress,” and by the ’20s she would sometimes talk about doing “serious roles.” She did do a few, but studios kept hiring her for character roles, and in my opinion she must’ve enjoyed them more often than not. Great history of Louise Fazenda – and of historic Hollywood, too. I didn’t realize she was married to Hal B. Wallis and that they were married for so long. Why thank you! This winter I’m going to be spending a lot of time researching Louise’s life in as much depth as I can. It’s astonishing that someone who was married to one of the most powerful, influential producers in Hollywood history has been so overlooked. That is astonishing, especially since she appears to have been a remarkable person in her own right. Congratulations on winning the CMBA Award, “Best Profile of a Classic Movie Performer” for 2017 for this article. It’s well deserved!